Maddie's Foundation has been a crucial supporter of Pet Network. Their support has saved the lives of thousands of our community's homeless and neglected animals at risk for euthanasia. As part of our ongoing collaboration with Maddie's Fund, we collect data and information for their ongoing efforts to learn how to reduce euthanasia and ultimately to ensure every animal possible is guaranteed a home. We thank Maddie's Foundation for their outstanding support and dedication to the homeless animals of the world. About Maddie's Fund: Maddie's Fund,® The Pet Rescue Foundation, (www.maddiesfund.org) is a family foundation funded by Workday and PeopleSoft Founder Dave Duffield and his wife, Cheryl. Maddie's Fund is helping to create a no-kill nation where all healthy and treatable shelter dogs and cats are guaranteed a loving home. To achieve this goal, Maddie's Fund is investing its resources in building community collaborations where animal welfare organizations come together to develop successful models of lifesaving; in veterinary colleges to help shelter medicine become part of the veterinary curriculum; and in the implementation of a national strategy to promote accountability and transparency in animal shelter operations. Maddie's Fund is named after the family's beloved Miniature Schnauzer who passed away in 1997. 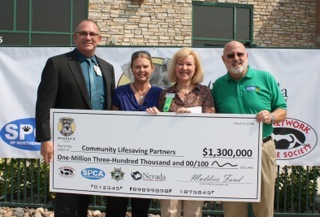 In 2012 Pet Network Humane Society, Nevada Humane Society, Washoe County Regional Animal Services and Northern Nevada SPCA were proud to accept a Life Saving Community Award from Maddie's Fund. Rich Avanzino, President of Maddie's Fund presented the award. Pet Network would like to express our sincerest thanks to Maddie's Fund for their amazing support of our community, the $100,000 donated to Pet Network Humane Society has assisted us in saving the lives of hundreds of animals.